CSC is committed to supply a wide range of sieves and sieve testing equipment as well as sieve analysis instrumentation. 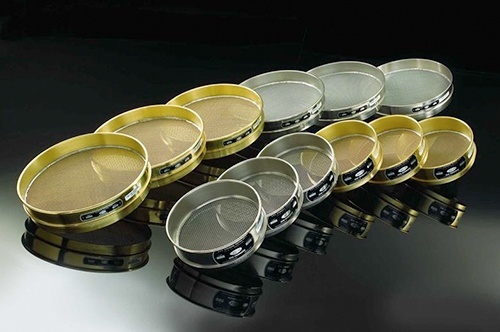 As part of this, we offer CSC Test Sieves for a full range of mesh sizes in 8 inch and 12 inch diameter frames. With the advent of the new ASTM E11-09 Standards for woven wire mesh test sieves, we revisited the concept of Certified Sieves. This analysis also included an assessment of the alternate methods of determining the suitability, fitness, or conformance to a woven wire mesh standard. We concluded that the most valid way to evaluate a sieve was to get a measure of its performance. The ASTM procedures delineate the acceptability of a woven wire mesh sieve based on a rational definition of acceptable variation, and measuring a small sample of openings. This provides a sound basis for assuring nominal conformance but does not provide a measure of actual performance.